Hmmm...It’s been awhile since we’ve posted anything here, hasn’t it? Much of our time is spent outdoors these days. We feel like we’ve been given a second chance at summer this year, so we’re taking full advantage. 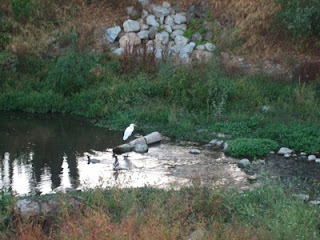 Andy’s commute sends him along the lovely and scenic Guadalupe River Park and Gardens, where he sees egrets like the one above and herons (which we couldn’t quite capture in the same frame as the egret). Elise and Heather go strolling in the stroller, and playing in the parks. New innovations this week have included a hummingbird feeder, a seed feeder for other birds, and a kite. Elise really likes the kite. Heather really likes the sound a hummingbird’s wings make in her ear while she’s hanging the fresh sugar water. Flapjack likes the prospect of having her “cat TV” up and running again. On Monday, we went to play at the home of some new friends. Olivia and her mommy, Sadie, live in an apartment community with a great duck pond. The ducks saw us coming and swarmed, which led Elise to believe this was some sort of petting zoo. Imagine the surprise of the ducks as little hands reached out to stroke their feathers instead of distribute bread! They ran away, trampling one another in the process. Once the feeding commenced, the ducks were pretty aggressive. At a few points, mommy had to insert herself between duck and child and say, “Step back!” which made Elise giggle. She then went right on holding on to the bread until another hungry duck bit her fingers and forced her to let go. To her credit, Elise stood her ground. She also didn’t seem to mind the duck nibbles. We’re finding that, more often than not, we’re having actual conversations with Elise. She asks really savvy questions about the world around her. (“Mommy, what’s this thing?” “It’s a support beam-it holds up the roof of the car.” “Oh, that’s good.”) She also really “gets” the idea that if she tells us when her diaper needs changing she’ll get to put a sticker on her chart. We know this because she described the process this evening using language we’ve certainly never used, and did so perfectly. Cool! If anyone out there knows of a book about learning to use the potty chair that does NOT include any reference to all children having accidents sometimes, can you point us in that direction? The biggest obstacle to potty training right now seems to be a fear of failure. Since all of her potty training role models in books have accidents ~every time~ we read the story, Elise has decided it’s a bad racket and wants nothing to do with it.